Start a business from R35 per day! The City of Cape Towns new re-blocking policy has been adopted by the local council and is set to roll out during the 2016 financial year. Re-blocking is a community-focused initiative whereby high-density housing and commercial structures are re-organised or clustered to decrease the extreme density in these settlements. Apart from an improved standard of living, it is vital for improving access by emergency and other vehicles, ensuring a safe space is available between structures to allow for any type of service delivery. 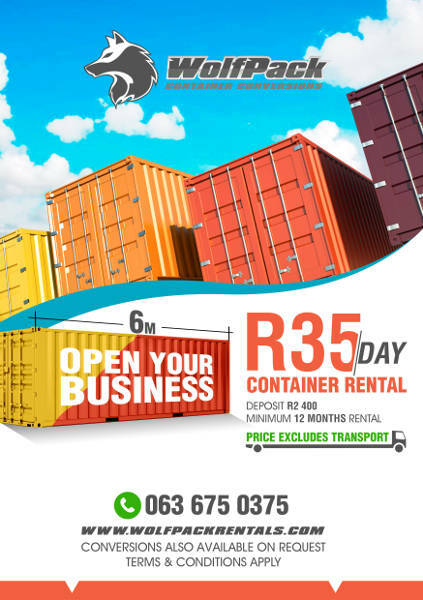 WolfPack Rentals is leading the charge through the application of our 6M commercial containers, available to rent for only R35 per day! This is the perfect solution to the re-blocking efforts lead by the City of Cape Town and allows any entrepreneur or business owner the perfect space to operate from. From spaza shops to barbers, doctors offices to dentists; everyone can benefit from our modular approach to the re-blocking initiative lead by the City of Cape Town. For new business owners or those wishing to expand their businesses and promote employment, our 6M commercial containers will suit any needs.